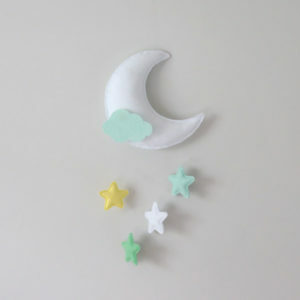 Shamrock patterned baby mobile, hot air balloon nursery decor. 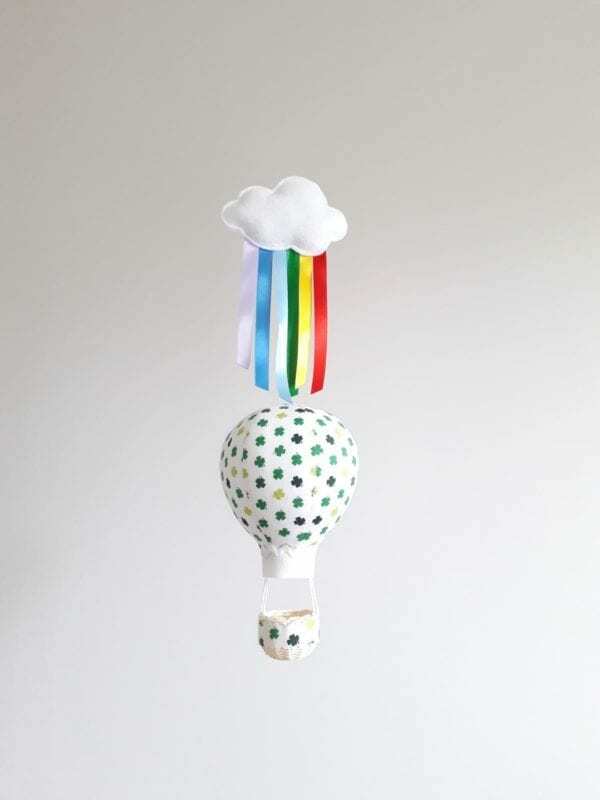 Fun and whimsical hot air balloons float under the puffy cloud and ribbon rainbow. 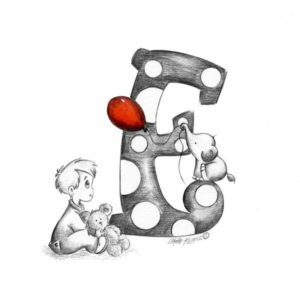 Each my little balloon is hand made from cotton fabric and stuffed with polyfil stuffing. 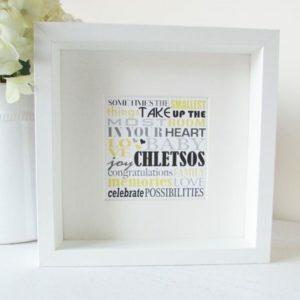 Great gift for new parents. Perfect decoration for Patrick’s Day. 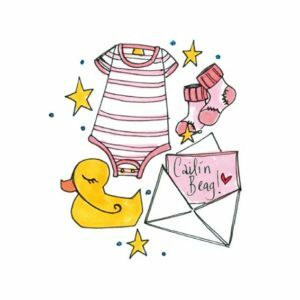 Availability: In stock Size: N/A Categories: Irish Gifts, Baby Shower, New Baby, Kids, Baby Shower, New Baby. 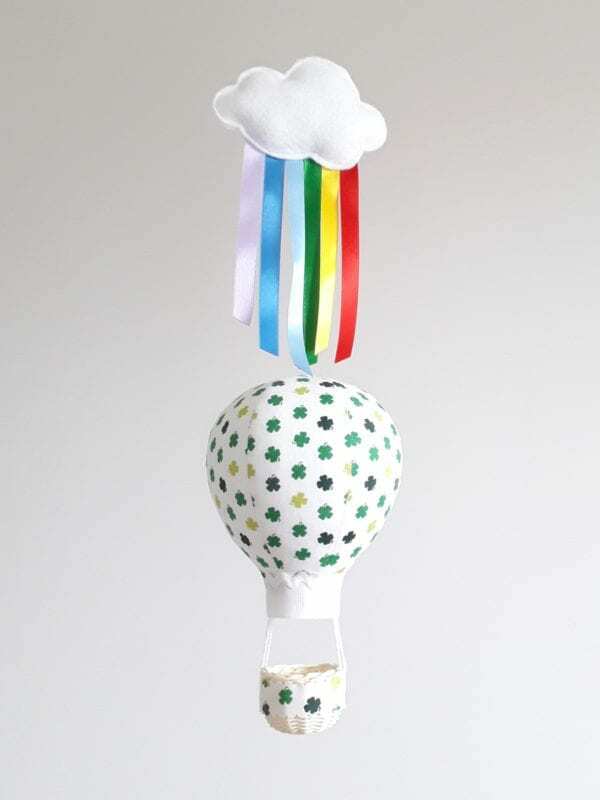 This hot air balloon baby mobile is carefully handmade from child friendly fabrics. 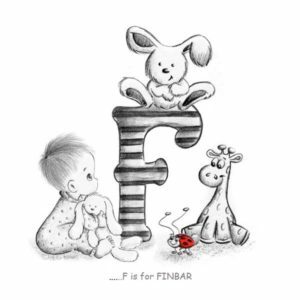 Great Irish baby gifts. Also perfect decoration for Patrick’s Day. Adorned with felt cloud and a ribbons rainbow, this mobile would enhance any nursery. 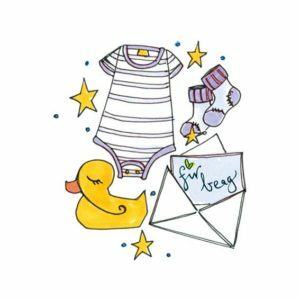 It’s made from 100% cotton with eco friendly certificates. From the top to the basket it measures 20.5 inches (52cm). Balloon itself is 9.5 inches (24cm) tall. 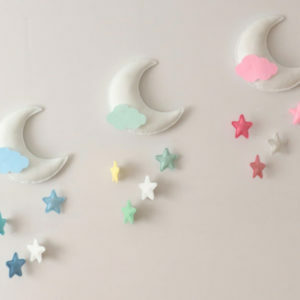 Strictly for decorative purposes and should never be within reach of babies or small children. Made in Ireland by nino. Pati from nino is a mum of two. 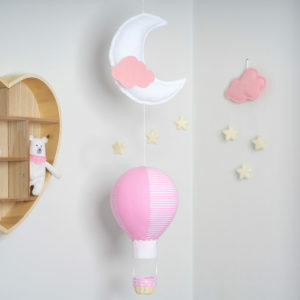 When she was decorating her daughter’s nursery she couldn’t find the exact mobile she wanted. 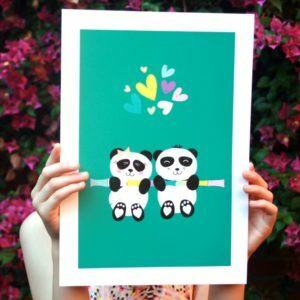 Therefore, she combined her passion for handcrafts with her dream of taking a hot air balloon ride and and came up with her first mobile. It was perfect and everybody loved it. 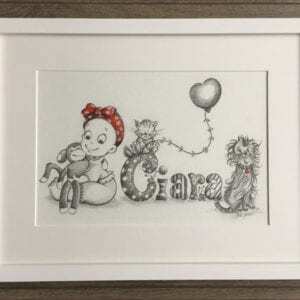 Furthermore, each of her balloons is carefully hand made from child friendly organic materials ensuring that her customers get a product she would be happy to put in the nursery of her own child all over again. Hi, my name is Pati and I’m a mum of two. 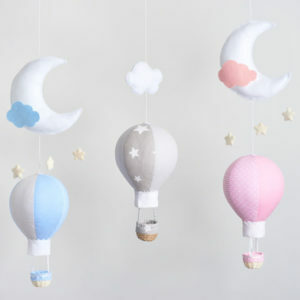 When we were decorating my daughter’s nursery I couldn’t find the exact mobile I wanted so I combined my passion for handcrafts with my dream of taking a hot air balloon ride and and came up with my first mobile. It was perfect and everybody loved it. 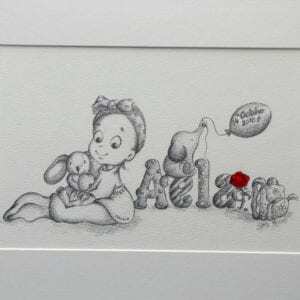 Each of my balloons is carefully hand made from child friendly organic materials ensuring that my customers get a product I would be happy to put in the nursery of my own child all over again. 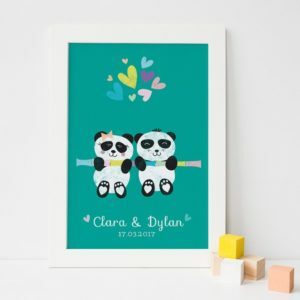 You will be notified as soon as your order has been dispatched by nino, typically within 3-5 working days.Estimated Delivery from date of dispatch: Within Ireland: 1-4 days. Internationally: 5-12 days.